New Grass Revival is at the top of any list of practitioners of progressive bluegrass music, or Newgrass as it is often called. In fact, the term “Newgrass” was likely appropriated by admirers of this group. Progressive bluegrass departs from the rather rigid conventions of traditional bluegrass which is characterized by specific roster of all-acoustic instruments – usually banjo, mandolin, fiddle, guitar, double bass, and vocals; its repertory of traditional folk songs; and its constrained musical structure – a limited range of key and time signatures, three or four chords in any given song, and tightly structured instrumental breaks. Newgrass takes these conventions and blows them to smithereens. In Newgrass you will find, infused into the bluegrass sound, electric instruments, drums, keyboards, and any other musical apparatus the world has to offer. The repertory includes grassy versions of pop, rock, jazz, world, and classical songs, and the compositions draw from every musical genre. Upon the traditional forms, are imposed uncomfortable key signatures, asymmetrical times and tempos, complex harmonic structures, and long improvised instrumental jams. Any way you want to categorize it, the romping music of New Grass Revival is spectacular. And this song, a live version of “Fly Through the Country,” epitomizes the Newgrass genre. The signature vamp sliding around in a minor mode on the strings of the electrified mandolin tells you right out of the box that this ain’t gonna be like your mama’s Foggy Mountain Boys. This song was written by Jimmy Webb, one of the greatest songwriters of all time, and I doubt even he could have anticipated where NGR would take his song. The words are about suffering from a congested Modern World state of mind – “my eyes are red, my head feels like an unmade bed” – which can only be cured by an escape to the country. After the verses and choruses the song jumps into a long wonderful jam. As arranged by NGR, this is a mandolin song, centering on the legendary Sam Bush (who, golldarnit, is also a spectacular fiddler). He flails out the solo and elides the notes as if his fingers were made of glass and then settles down in kinda smooth and sneaky so that guitarist Curtis Burch can dive in picking out swarms of notes punctuated by elaborate chords, until the mandolin brings on another round of singing, and then the mandolin, distorted by a gurgling flange, carries on a protracted conversation with Courtney Johnson’s intricate syncopated banjo. Toward the end, when you hear John Cowan howl the word “Fly” over nine bars, you have been beguiled so deep and whooped so high, you know it doesn’t get any better than this. Jimmy Webb, “Fly Through the Country,” Barren County Music (BMI) (No date). 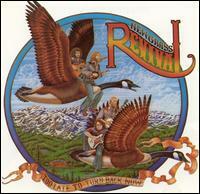 From: New Grass Revival, Too Late to Turn Back Now, Flying Fish Records, Flying Fish 050 (1977). Album design – Penny Case; Cover design and illustration – Rance L. Barela.